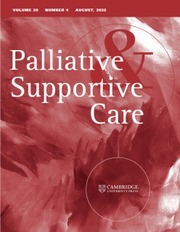 Palliative & Supportive Care is an international journal of palliative medicine that focuses on the psychiatric, psychosocial, spiritual, existential, ethical, and philosophical aspects of palliative care. Its aim is to serve as an educational resource for practitioners from a wide array of disciplines engaged in the delivery of care to those with life threatening illnesses along the entire continuum of care from diagnosis to the end of life. The journal's scope is broad and relates to all aspects of palliative medicine that do not directly or exclusively deal with the administration of palliative care or hospice services, or with the primary management of pain and physical symptoms in palliative care.